The Hungarian government decided to re-negotiate 26 public-private partnership agreements in higher education. Starting from the fiscal year 2017 these former investment contracts of university facilities, such as dormitories, will be terminated. The assets to be bought back will partly remain under the universities’ control or they will be nationalized and later sold or used for other public purposes. Is this just another field of Hungarian fiscal unorthodoxy? Or is it part of the general trend, which already showed hostility towards any new public management style innovations? PPPs deals highly divide politicians, economists and social scientists at large. It is not a simple public service and financial management issue any more, but a conspiracy theory of big business interests has evolved around it. However, similar to other modernization efforts and concepts, the success or failure of PPP very much depends on its institutional environment in a specific country. This brief note argues, that mostly this factor determines whether the governments or the private contractors benefit primarily from PPP. Public-private partnership in a narrow sense is a long term cooperation between governments and other non-public actors for providing public services. The client central or local government arranges the service provision by involving the resources of the contracted private sector organization. PPP deals might cover capital investments and service delivery, from design through financing to service management and organization. Presently PPP account for 15% of central government capital expenditures among the OECD countries, led by UK (648 projects) and Korea (567). PPPs started to emerge in the 1990s with other New Public Management techniques. By splitting the public service provider and producer functions the government’s client, regulator and financing roles were separated. It helped to set clear priorities towards the service organizations and at the same time increased the customers’ role, as well. Service beneficiaries not only pay user charges for the received public services, but they can directly influence service producers through complaints and other feedback mechanisms, as well. Within this new framework the tasks and responsibilities of all parties were made clear. It supported policy making, because fiscal and social goals could be exposed and prioritized in an objective way. This aimed to make the entire system of public service provision more efficient and effective. In a classical PPP scheme the various forms of private sector participation, the flow of funds and the client government’s role are identifiable: the government orders the service, defines the service performance requirements and forms of compensation, the private partner brings in service technology and management expertise. PPP is usually a long term agreement, which makes the recovery of costly infrastructure services possible for the private contractor. 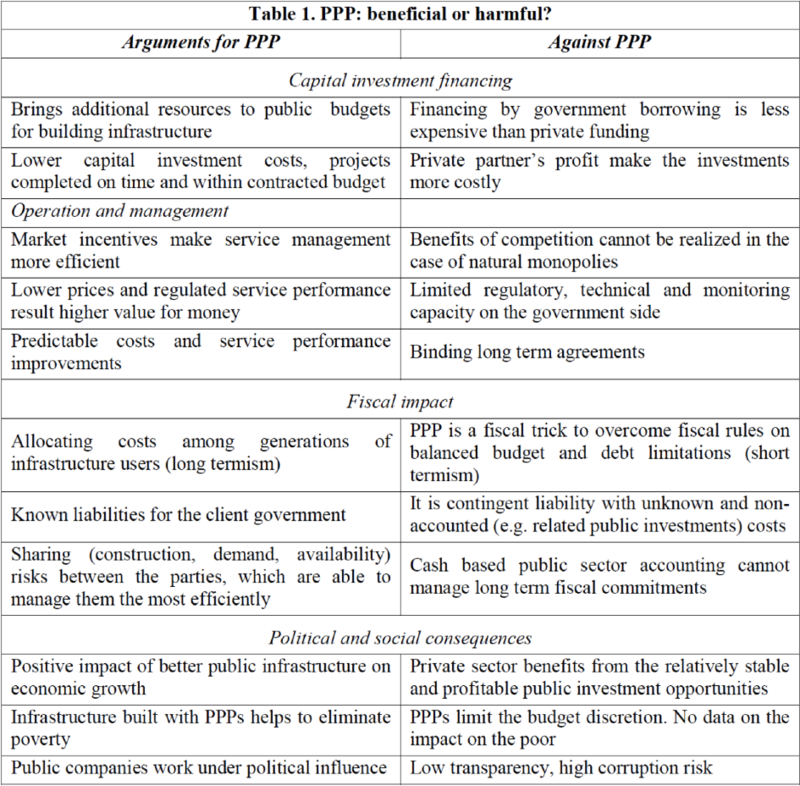 The key public and private actors of a PPP scheme are summarized in the Chart 1. below. The private partners can be involved in the project company, in the construction and the operation or even as a financier. Similarly to any other broad terms, such as privatization, the public-private partnership is also used in many different ways. So the international development and finance organizations made huge efforts to share information on PPP schemes and to disseminate techniques for capacity development purposes. There are various professional resources, for example the knowledge center of the European Investment Bank or the World Bank Group’s database, regulatory, information resources. The World Bank has also established a Public Private Infrastructure Advisory Facility in 1999, which provides technical assistance to low and middle income countries. The OECD governance program has formulated recommendations on managing PPP schemes and it was included in its governance monitoring survey, as well. Donors themselves established a trust fund for promoting private sector involvement in infrastructure development, which invests in PPPs in developing countries. During this two-decade-long learning process the focus of PPP development has changed significantly. Based on the lessons learned in the rich and in the developing countries the main topics moved from the technical and financing issues towards the more sophisticated and softer conditions of successful PPP practices. Now the mentioned resource centres provide information on details of various contract types, assessment of non-monetary effects of PPPs, gender issues, etc. So there is a very clear shift in public-private partnership policies, which shows how the technical knowledge has evolved. Working with the private sector is always a dangerous business for the government. When the public meets the private sector – through construction contracts, purchase of goods, in local economic development or by setting tax preferences – the corruption risks increase. If governments really want to operate in a transparent and accountable way, these potential problems should be managed. So why PPP would be different? Just the rules of the game have to be learned and institutions should be developed for balancing the private and public interests. A PPP deal is perhaps more complicated and have long term implications, but if all its advantages and potential negative effects are known, then it can be kept under control. The usual arguments for and against public-private partnerships target four main areas of PPP schemes. (Table 1.) As a form of financing capital investments it can bring additional resources and as the investment projects partners are bound by contracts, the usual cost increase and delays will be more limited. The counterarguments emphasize the advantages of public sector borrowing and take the contractors’ profit as an extra cost. At the operation and management stage the market based incentives are on the positive side of PPP. However, these projects can be rarely assessed in a quantifiable way and benchmarks seldom exist. But it was soon recognized, that competition in the case of natural monopolies is rather artificial. Developing the government’s regulatory powers and service monitoring capacities need a lot of efforts and is a lengthy process. Opinions on the fiscal impact of PPP are also divided. If it is properly managed, PPP can highlight the long term consequences of infrastructure project financing and it can allocate risk among the parties. However, short term fiscal goals might dominate the budget decisions and they could disguise future fiscal burden on public budget. So again what really matters is, how these decisions are made. Finally, in a developing country context, the political and social consequences of PPP matter a lot. Simply by building new infrastructure would promote economic growth and development, limit the poor public enterprise governance practices. The other side emphasizes that PPPs just create a steady revenue flow to the private sector, it limits the budget discretion beyond election cycles and it is often less transparent than the public enterprise management. As the administrative-fiscal environment matters a lot, the balance in developed and poor countries will be different. Public pressure on governments might bring results in the rich countries: see for example the movement against PFI. In developing countries, with weak public institutions, the high public investment is usually associated with elevated corruption level.Deeper analysis of specific cases also proved that PPP schemes might bring mutual benefits and if properly managed they can work much better than the widely shared public views suggest. It should not be forgotten, that governments also learn a lot from the cooperation with the private sector. Advantages of New Public Management techniques was not only the better service performance, but their indirect impact on government operation. Working with PPP schemes, central and local governments were forced to better specify their own service requirements, develop new cost assessment methods, introduce contracting and monitoring practices, etc. Many of these methods were adapted from the private sector or they were developed under these partnership schemes. The debate over public-private partnership is still going on. The great recession after 2008 decreased public capital investments of all types and had a negative impact on PPPs, as well. Funds for public and private investment have declined and the trust in private sector significantly declined, in general. But by now PPPs are back and the new infrastructure investments, such as in alternative energy supply and green technologies need private sector participation both in developing and rich countries. The growing hostility towards the private sector can be reversed by introducing new fiscal, regulatory and procedural techniques. It is already widely known that PPP can be better built into public service provision by developing transparent budgeting and procurement practices, introducing value for money assessment, caps on PPP obligations, using accrual accounting in the public sector. However, these complex public financial management methods will work effectively only if the political and governance environment is able to absorb them. PPP is not a magic bullet and the institutional development process takes time. But it could improve public service performance, when its introduction is adjusted to the quality of the broader governance framework. On the one hand PPP is a complex, time-consuming and costly solution to supply public duties. On the other hand it could be a good method to satisfy certain public needs. As the author mentioned PPP has favourable properties. It is particularly suitable to produce goods and services from which consuming non-payer consumers may be excluded. So PPP can be a good device in the State’s hand but its advantageous features are not realized automatically. Every PPP contract needs careful preparation, impact assessment. Hungarian experiences show that these former prudent deliberations, impact examinations were not happened. This is one reason the Hungarian PPP contracts’ lack of success. The other reason is the Hungarian legal institutional environment. What should we do to have a chance to create a successful PPP contract? − There is a need to eliminate the regulatory vacuum because expressly legal standards for establishing long-term state contracts lacking in today's Hungarian legal system. Earlier there were fragmentary regulations for these treaties in our general act of public finance but they were compulsory only for contracts made by central government and not for contracts made by local governments. − In addition, we should strive to ensure a stable regulatory environment because the profit-oriented stakeholders manage as a risk the rapidly changing legal standards and they price themes. This will result in increase of costs. Because of the former reasons, it should define the stability of development policy as an aim. − It would be important to accept and adapt legal requirements which grantee an objective comparison method of public task provision alternatives. This comparison should be important after the investment decision is taken. − Essential during the implementation and operation of PPP projects that the state lives with its control right, keeps it and does not contract it out. − It is determinative that the state does not miss the consistent application of sanctions when its private partner does not fulfil the contract or fulfil it late or wrong. Lack of sanctions – thought that the missed interests’ enforcement by state – were problems in many domestic PPP investments. − Also it would have a great need for a system of legal norms which grantees transparency of the utilization of public resources. This could be ensured by consistent control and monitoring, by disclosure of these controls’ results, by the detailed and same formed indication of the Budget and Final Accounts’ data in each separated projects. It is a problem in Hungary for instance when each ministries’ PPP projects are in an aggregated form in the Annual Budget and Financial Accounts Acts. Thus amount for each PPP investments are not separated from each other. Still belong to the transparency is that: public funds user companies do not rely on business secrets the context of budget support and ensure the publication of these data. The overall conclusion is that: PPP is a complex contractual construction which can be an option of original investments by the state on many fields of public task provision and which is able to adopt for the ever-changing social and economic needs which brought it alive. PPP’s application in practice does not free from challenges because of the long contract length and the presence of for-profit public sector partners in the public tasks provision. Due to the former points and the state short-term budgetary planning and because of the medium term policy objectives PPP can be a constant subject of professional and policy’s debates.